The library staff at Yeshiva University mourns the loss of our dear colleague and friend, Miriam Meiri, ז”ל , who passed away last week. In his eulogy for his mother, Miriam’s son Ya’akov described her devotion to the Library where she spent over thirty years. Her work in the Library and its milieu of professors and students helped satisfy her intellectual curiosity and gave her emotional satisfaction as well. When the financial crisis of the 1970’s forced the university to let Miriam go, she was heartbroken. She longed to return and was extremely happy when she was re-hired. Miriam was full of vigor and vitality and her work ethic never waned, even at the very end. 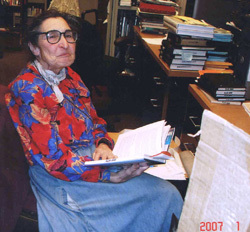 She was diligently cataloging a book at her desk in the Gottesman Library the afternoon before her scheduled surgery.